Do you know where the picture of the post card is from? The opposite side of the canyon to mine. oh, nice pic that i almost missed, as its the last one on the previous page. The top pic is of the Colorado state capitol in Denver. The trees in that area are really grown nowadays. I googled a couple of newer pics and theres a big spruce now, covering almost one wing of the building, it wasn't even there in the old pictures. love the 2 55 mopars in the picture. these early fls rave really grown on me in the last couple of years. Location: NY & VT I've also liked certain early FLs more & more in recent years, particularly the '56 Plyms... the '55-56 DeS and Chryslers, while I like them, are rather heavy looking, contradicting somewhat the idea of Foward Look elegance and lightness so well demonstrated in all the '57-61s. Location: So. California This picture deserved a little corrective action. This is the best I could do with it. Location: Victoria, BC, on Vancouver Island, Canada A local member of our WPC Club, Gerry McDonald owned this 1960 New Yorker in the mid 60s. Gerry installed a full 300-F cross-ram setup in the car. I believe these photos were taken in the Canadian Rockies one winter. Location: Southern Sweden - Sturkö island Cool Ian - seems like this car is for sale now? Cool Ian - seems like this car is for sale now? It's not the same car. Gerry's car had swivel seats, and I believe the cross rams were removed in the 1970s at some point. Very similar car through. Wheels are different on the Ebay car also. Location: North Australia Amazing how the 58 Plymouth stands out in the car park pic. The roofline does it. 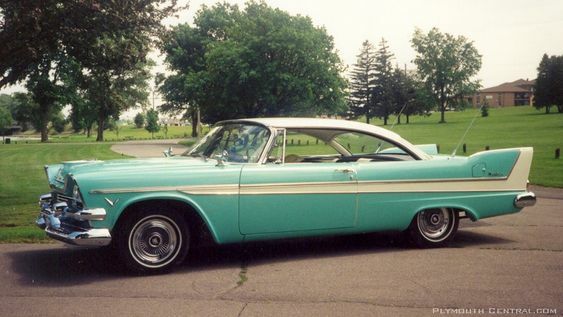 I cant tell if the 59 Plymouth is a 2 or 4 door? Location: Frederick, MD Memorial Day 1962, Hopewell, NJ. Elementary School in background. From my grandfather's old slides. Location: So. California That radar pic is REALLY neat! Weird that he's not using '59 Dodge caps though. Anyone recognize the ones on there? My guess is they are '56 Dodge caps. I wonder why those would end up on there. That radar pic is REALLY neat! Weird that he's not using '59 Dodge caps though. Anyone recognize the ones on there? My guess is they are '56 Dodge caps. I wonder why those would end up on there. Maybe, maybe not. Definitely not 59 Dodge poverty caps. dish (smoothie type) all the way up through 1962 police models. That doesn't make sense. The dog dish caps can be used on any rim size. The '59 car in the last picture is using '59 dog dish caps as you would expect. Steel versions of the '56 Plymouth caps were used on '57 Dodge Trucks. I *think* that '58 Dodge trucks used steel versions of '57 Plymouth caps, but in '59, they received their own cap. which box got checked on the order sheet. Location: DFW, TX Interesting that the '56 hub caps continued for 15" wheels into 1959 (and maybe later). Didn't all Mopar police cars also use '57 Plymouth steering wheels into the '60s? I thought those heads looked a too wide to NOT be a hemi. Actually the Emi-Sul, which took two and a half years of work (and investment of $1 million dollars by Chrysler, which had taken a controlling stake in French Simca in 1963), was an adaptation of the Ardun kit created by “Mister Corvette,” Zora Arkus Duntov. The kit was used by hot rodders and American racers using the Brazilian Ford V8 engines in France. Simca of Brazil, through Pasteur, developed new aluminum heads that housed the valves in the block, and adopted a new intake and exhaust manifolds. They also eliminated the single-axle central camshaft, as the new heads each had a timing belt (that would become popular in the future); the drive was made by lifters and rockers." The "Brazilian" Ford flathead V8 was actually the American 136.0-cid (2.2-litre) Ford flathead V8 introduced for 1936 in Great Britain, France and Germany. It had 60 hp as opposed to the regular 221.0-cid flathead Ford V8 with 85 hp. and was introduced for the U.S. and Canadian markets for the 1937 model year. Ford of Canada, which owned all the Ford operations in the British Commonwealth except for Great Britain, offered the 60 hp engine in all their markets. The larger V8 was considered too big and used too much gasoline in many markets around the world back then. And Ford in Britain, Germany and France were building cars smaller than those on the US market. Ford of Canada sold Canadian (aka American) as well as British models outside of North America. Ford of Canada dropped the Canadian market 2.2-litre V8 for 1938 while the U.S. parent replaced the 2.2-litre V8 with a 225.9-cid flathead six for 1941. The last of the larger flathead V8 engines (239.4 & 255.4 cid) would be dropped in the U.S. market for the 1954 model year and the Canadian market for the 1955 model year. The Ardun hemi conversion for the 2.2-litre V8 was developed by the Arkus-Duntov brothers during the early to mid 1940's. After the war the Ardun conversion became quite popular for the hot rod crowd as they could replace the heads and side valves with a more modern and powerful upgrade with hemispherical heads and valves. The smaller 60 hp V8 was still common enough in the late 1940's into the 1950's in the U.S. to supply the necessary engines. The 2.2-litre flathead V8 was built in Britain through 1950, with the Ford Pilot being the last British-built Ford V8. 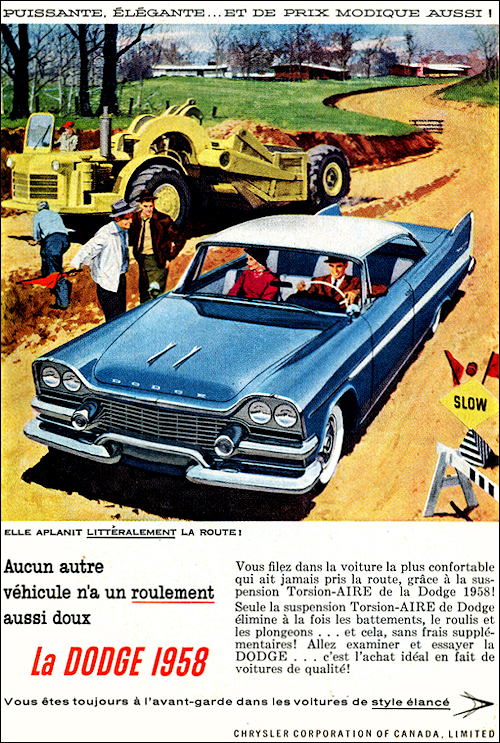 In France the whole operation, including 2.2-litre engine, Vedette car, and plant, were sold to S.I.M.C.A. in 1954. Ford received 15% of Simca stock which they sold to Chrysler in 1957. Chrysler acquired a further 10% interest in Simca in 1957 and, with the separation of the auto manufacturing parts of S.I.M.C.A. into Simca Cars in 1963, controlling interest. Thus the Ford flathead V8 became became part of the Chrysler Corporation. 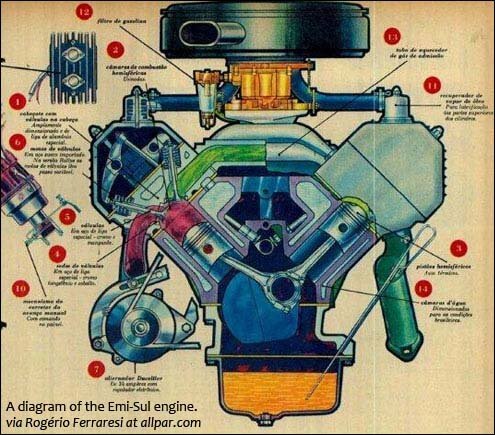 The Emi-Sul looks to me to be a hemi. It has the valves in the correct placement and the spark plugs at the top of the combustion chamber. Have read a number of articles on the engine with it being described as "almost" hemi. Looking at the illustrations and the engine, there does not appear to be any "almost". Just noticed this little bit in the Allpar article - Simca of Brazil "developed new aluminum heads that housed the valves in the block". Actually the new heads had the valves in the head instead of the block. The old flathead V8 had the valves in the block. Interesting that the '56 hub caps continued for 15" wheels into 1959 (and maybe later). Didn't all Mopar police cars also use '57 Plymouth steering wheels into the '60s? the drive was made by lifters and rockers."? that in this way, seeming to apply to the Ardun heads. Which it certainly doesn't. Location: Lower Mainland BC 56 Dodge at the Continental Divide towing some old beast. Location: northern germany One of a handfull 60 Plymouth convertibles released into the wild captured in its natural habitat, way back when. Location: So. California A Plymouth from my wife's family pictures. Except for the black walls, it might have been my first Big-Tailed Beast. I see a '65 Chevy there, so by then it, along with its chrome skirts, was gone. The skirts didn't last a year -- three sets were part of the inventory of Midnite Auto Supply. Location: Dalveen, Queensland, Australia Isn't that a '56 Plymouth a few rows forward too? Would love to see your original BTB! 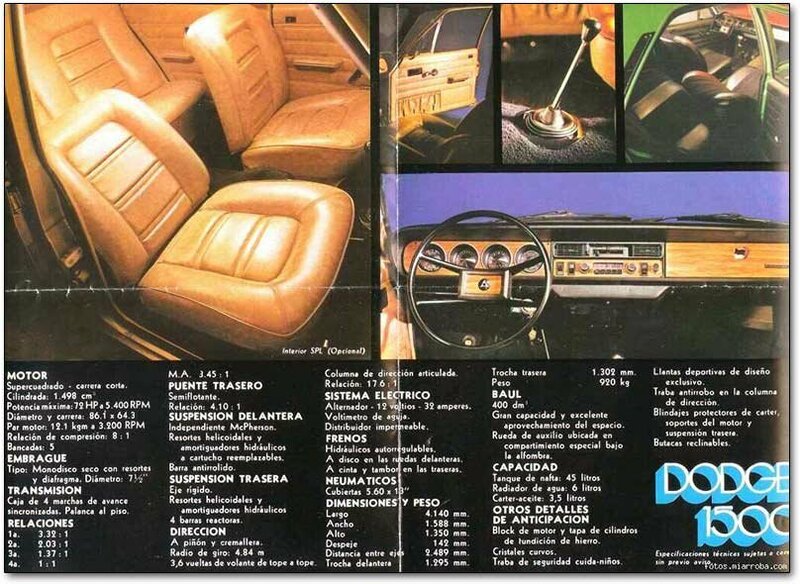 I remember you told me it had a green interior. Must have been a beauty with skirts to boot! This one is in a NY city parking lot, so i guess it's not yours. Location: northern germany Plodge or kustomized Plymouth in Florida? A 1958 Dodge Mayfair 2dr hardtop. Lots of Canadians head for Florida for the winter and use their own car to get there and back. That way they have transport while in Florida. Plodge or kustomized Plymouth in Florida? I count five letters on the hood so "DODGE" is a good guess. Based on the rear fins and side trim, I would have to guess Plodge from either Quebec or Ontario Canada. I can see a front plate but can't make out the Province.